What do I do when I have received a recurring billing from PayPal? Most of our billing is currently handled through PayPal. You can cancel a recurring payment or a duplicate bill through your PayPal account. Log in to your PayPal account and click 'Profile' at the top of the page. 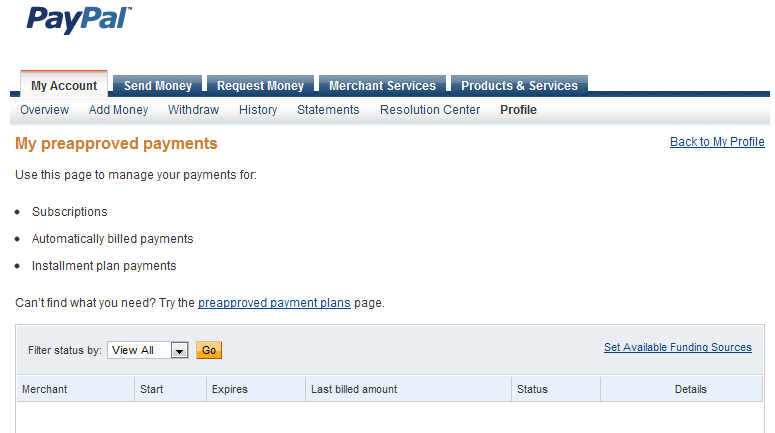 Click 'My Money' then click 'Update' (to the right of 'My preapproved payments') to locate the payment in question. Select the payment in question for ShiftPlanning and then click 'Cancel'. Now, you can request that the appropriate credit be applied to your Humanity account by emailing us at support@humanity.com.